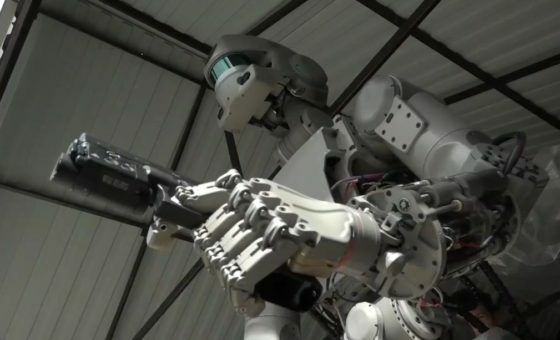 Experts from numerous countries around the globe are gathering for a United Nations meeting to discuss “killer robots.” The weeklong event that opened Monday is the second at the U.N. offices in Geneva and will focus on lethal autonomous weapons systems. Although U.N. officials say that in theory, fully autonomous, computer-controlled weapons don’t exist yet, and the debate is still in its infancy, the discussion is all but mandatory as the experts and officials have often grappled with the very basic definitions. The United States has argued that it’s premature to establish a definition of such systems, much less regulate them, but the meeting will focus largely on those aspects. Other experts and some of the top advocacy groups say governments and militaries should be prevented from developing such systems, which have sparked fears and led some critics to envision harrowing scenarios about their potential uses. And who is to say that a ban will stop the future use of killer robots anyway? If a country decided to use them despite the ban, ink on paper will be meaningless. At a news conference hosted by the Campaign to Stop Killer Robots, Williams said the group wants “meaningful human control” when it comes to the use of military weapons. They also want to progress toward a ban on all computer-controlled weapons systems.